Venice is a magical place of Italy. 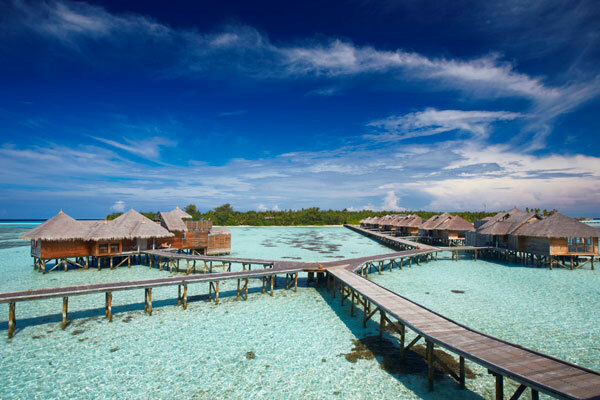 Most of the couples choose this place for their honeymoon. Anyone who visits here will lose himself in its charm. Besides taking a ride in a gondola, you must also check out the landmarks here. If you ask anyone what is there to see and do in Venice, you will be given a lost list of must-see places and attraction. But people would consider only a fraction of the list. If you want to know the real top sights to see in Venice, then you must refer to our post. This stunningly elaborate church sits on the piazza of the same name. 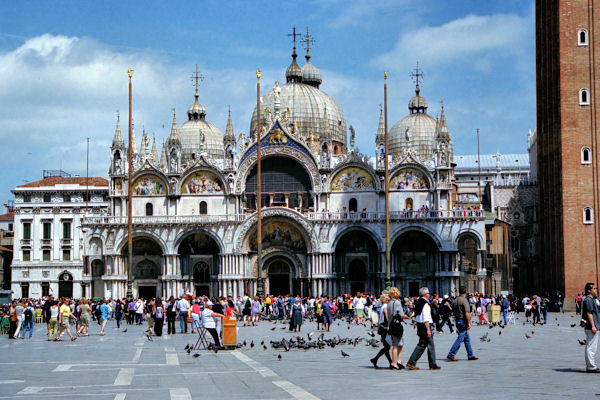 The basilica is the symbol of Venice’s former glory. It is regarded one of the best examples of the Byzantine architecture in the whole of the world. Its design is basically a mixture of western and eastern architecture that results in a unique structure. The church was initially built in 828, but the basilica was rebuilt in 1094 after a fire ravaged its earlier version. Today, you will see it opulence shining in the every corner, right from the four bronze horse guarding the entrance to the Pala d’Oro. We would advise you to come early to avoid the crowd. Its domed interiors are marked by intricate mosaics. The general site visits are free, but the in-house museum and sanctuary will charge you a bit. The Palazzo Ducale is an ethereally beautiful attraction of Venice. The place has witnessed an intriguing history as the official residence of the leader, the palace of justice and set of government. Everything, right from the execution, to the affairs of the Venetian leaders was carried out here. The Doge’s Apartments are on the first floor, but the real highlights are the lavishly decorated 2nd-flooor chambers. There is also a hidden door that gives out a mysterious past. You can take a tour of this building for free with your museum pass. 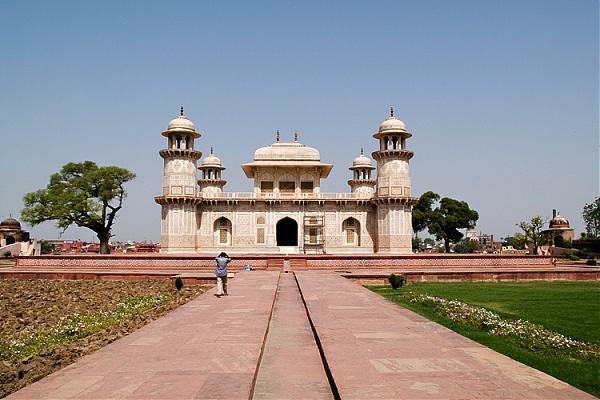 But many of the travelers recommend buying a ticket for the Secret Itineraries tours. The tour will give you all the juicy details of the building along with a trip around the palace’s secret passageways. 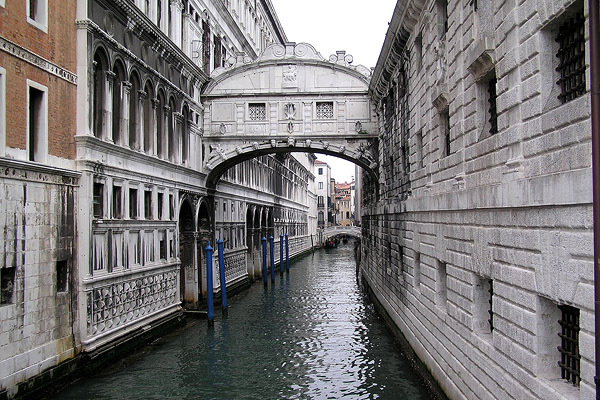 The Bridge of Sighs is the legendary and beautiful bridge in Venice. It stretches high above the fabled canal and is well known as the finest example of the bridge architecture in the world. It is a must see place for anyone visiting Venice. The bridge was designed by Antonio Contino and was commissioned at the beginning of the 17th century. Bridge Of Sighs was originally built to connect the Old Prison to the New Prison, situated directly across the river. When the prisoners would walk across the bridge, they would ‘sigh’, catching the last glimpse of the outside world. This is how the Sigh Bridge got its name. Legends also say that if two lovers kiss on a boat under this bridge, they will be granted eternal bliss. The Galleria dell’Accademia is a gallery brimming with an expansive collection of Venetian art. 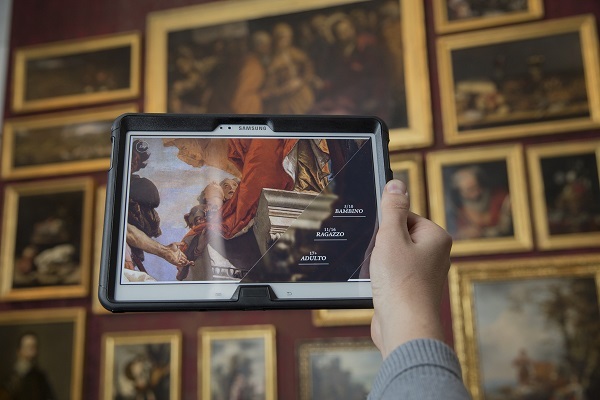 The place is ideal for people who enjoy the artworks of the 14th and 15th-century artist.The museum houses work of arts like Titian, Bellini, Veronese, and Tintoretto. The art gallery was made by none other than Napoleon. The lavishly carved ceiling is a striking attraction of this place. Some of the travelers often lament over its size, saying that its numerous rooms tend to become overwhelming. But we personally loved the place. 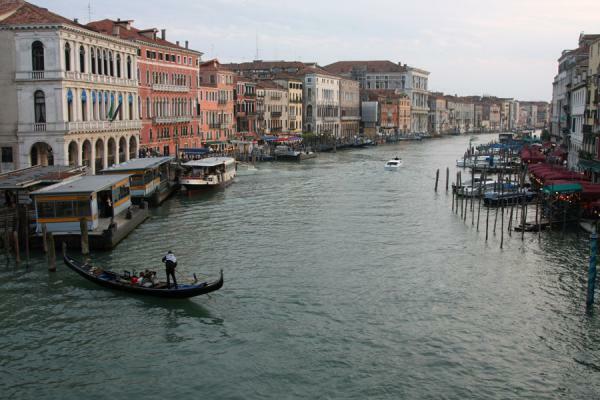 The Grand Canal, also known as Venetians as Canalazzo, is a traffic corridor sweeping through the incredible city. The canal snakes through the city, traveling from the Saint Mark Basin to Santa Lucia rail station. This canal is lined with buildings that were mostly built from 13th to 18th century. Most of these buildings were constructed by the wealthy Venetian families. This stunning waterway measure 3,800 meters. The majority of Venice’s traffic cruises up and down the canal, where it is water taxi or famous gondolas. We would recommend you to hire a gondola for a romantic row along the canal. The Rialto Bridge is a busy crossing in Venice and also one of the most photographed bridges in Venice. Being one of the top most tourist attractions, the bridge is included in most of the tours of the city. The Rialto Bridge connects the districts of San Marco and San Polo. 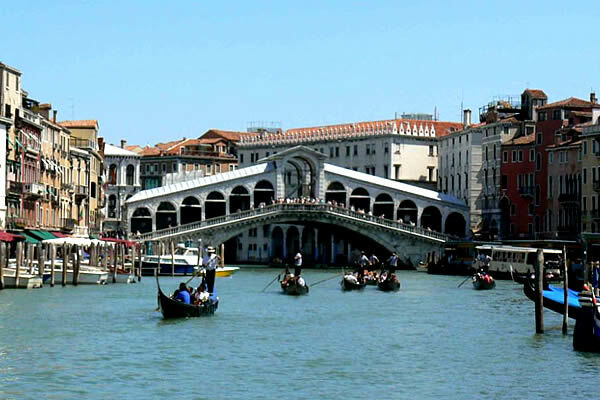 For more than 300 years, the bridge was the only way to cross the Grand Canal. It replaced various wooden bridges that occupied the same place since the 12th century. The bridge was once crowded with merchants, but is now swamped by tourists. Did you know that several designers were approached to design the bridge? The current design of the bridge is the work of Antonio de Ponte. 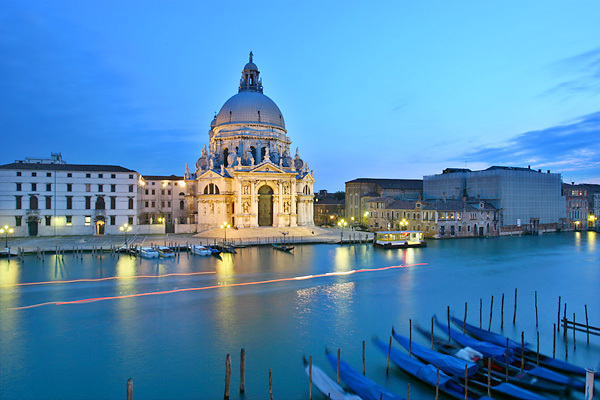 Santa Maria Della Salute is a magnificent structure of Venice. The church was built in the 17th century on a narrow strip of land, right near the Grand Canal. The locals refer the place only as Salute. A Venetian senate proposed the construction of the church in response to the terrible plague that killed about 1/3rd of the city’s population. The Senate had promised to build the church to honor Mary if she would free Venice from the plague. After the epidemic had ceased, the Senate kept his promise and started the construction of the church. He also decided that the new church would be the new site of the annual Feast of Presentation of the Virgin. 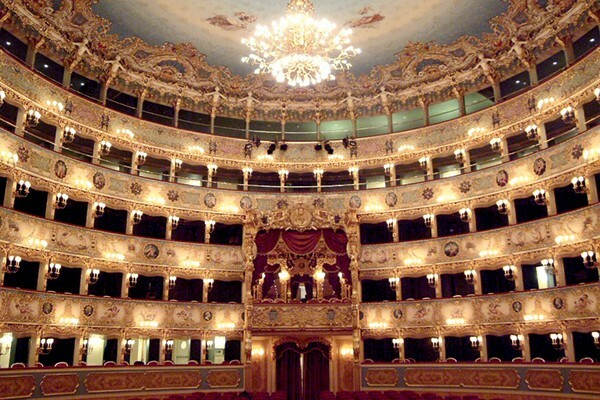 The Teatro La Fenice is the best-known opera house in Europe. It has been the site of numerous premieres during its history. The construction of the opera house began six years after San Benedetto Theater, an earlier theater building, was burned to the ground. After the completion of the construction, the theater was given the name Phoenix, to honor the mythical bird that rose from the ashes. Unfortunately, the church got burned down yet again, but was rebuilt quickly. The performances at Teatro La Fenice must not be missed at any cost. You can also partake in the visual pleasure of the Italian ballet, music, opera or theater performances. St. Mark’s Square is the most popular piazza of Venice. It encapsulates the splendor of Venice’s past and present. The Square was constructed in the 9th century and was dotted with trees. But now you will always find this Square thronged by visitors and vendors selling souvenirs. You will also find some restaurants here. The prices of this restaurant run high, but some travelers say that the ambiance is worth it. Avoid the square in the late afternoon or evening, as it is the most crowded during these times. Most of the major attractions of Venice are located in this square. 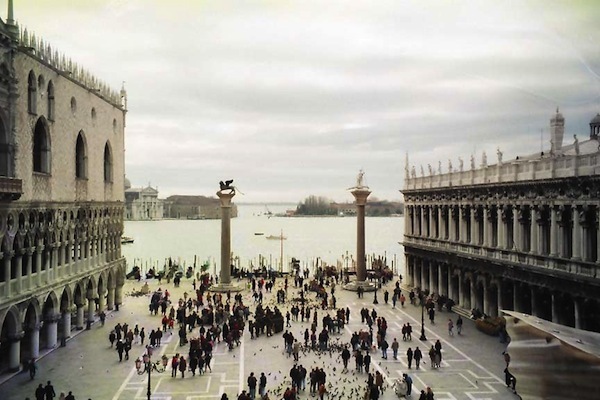 The Doge’s Palace and St. Mark’s Basilica are the two most popular attractions of this plaza. Zattere is a favorite spot for strollers. It runs from the Dorsoduro along the Canale Della Giudecca. The Zattere was built as a landing lock for the delivery of timber required for constructing buildings and ships. 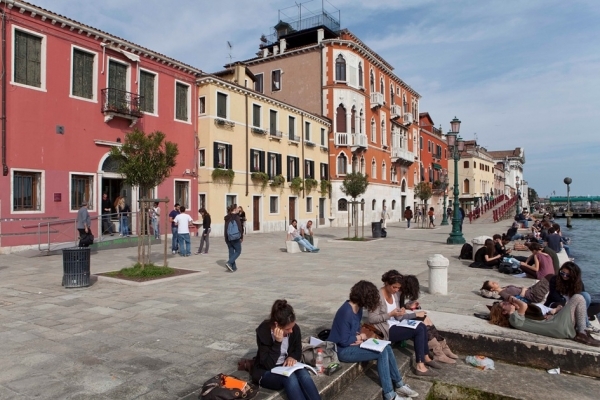 Today, Zattere is a spacious promenade running along the southern shore of Venice’s Dorsoduro District. There are many fascinating monuments along the length of Fondamenta Delle Zattere. The Giudecca Island lies to the south of Zattere. A walk along the Zattere provides excellent views of the island. If you head further down the promenade, you will find some palaces that are now government offices. 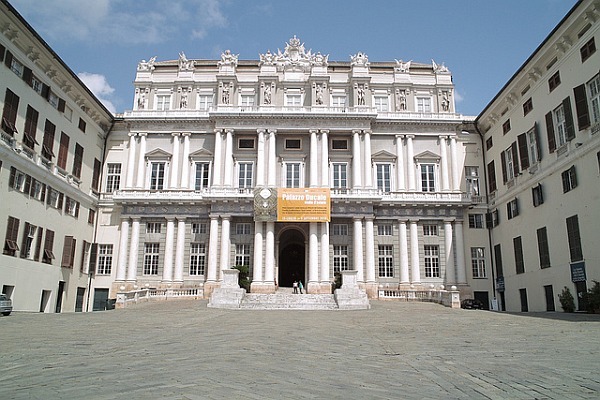 These include the Palazzo Molin and Palazzo Priuli Bon. Do you think we have missed some important sights in Venice? Then please tell us by commenting below. We will wait for your inputs.